The Mediation Dictionary is a work in progress and one of love for the many valuable properties of mediation and other important types of alternative dispute resolution. I have tried to find as many terms, definitions and related legal idioms as possible. Although I came up with quite a few words and phrases, doubtless some have been overlooked or there may be other errors that should be corrected. Let me know if your search for a particular mediation or alternative dispute resolution definition is not here -- I will personally find a fulsome answer for you. Please note that this resource was written in American English and so will have "spelling errors" when read by English readers from the UK. 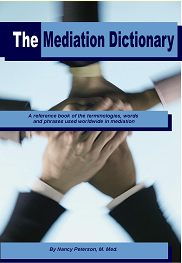 Thank you for visiting The Mediation Dictionary, and let me know if I may help in any way.